As a mostly-retired person, I sure notice the difference in income. I always knew that theoretically, but after two years of working intermittently, I notice it practically. I've become more value-conscious, especially when buying clothes. This spring, I wanted a fresh striped marinière. Wear it with jeans or a pencil skirt, add a scarf or your favourite earrings, and voilà, all dressed. 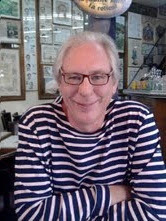 In the full-time days, I'd simply have ordered one of several models of St. James shirts offered by a Brittany vendor who's served us for years. The "Meridien" is a more substantial shirt than the "Galatee" model, sold by J. Crew, and featured by Deja Pseu (writer of "Une femme d'un certain age") in her post on marinières; the heavier model is useful here, where you can see your breath in May sometimes. Price for the J. Crew shirt is $106, plus shipping. Shoppers outside the US will add duty and taxes (count on around 30%), so that nudges $145 for me. The sturdy and well-made Meridien is pretty much Le Duc's spring through fall uniform. I've been careful not to wear mine at the same time or we look like Dupond et Dupont. Last year, I ordered one of LL Bean's French sailor shirts and was très contente; it's a more feminine cut, fitted in the torso, with a wider neckline and 3/4 sleeve. I redeemed a $10 gift card, which reduced the price to $20, and they shipped for free. 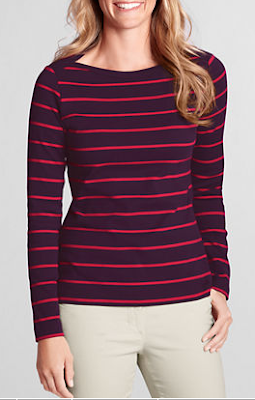 A few weeks ago, Lands' End had a one-day sale on a shirt I'd considered, their French Terry Balletneck: $15 and free shipping! (I had to spend $50 to get free shipping but was ordering housewares for a son anyway.) Price is now back to $29, which I'd still pay. The hand of the fabric is beautiful, fine and smooth on the outer surface, with an inner finish of very fine terry. The cut has a deeper scoop than the classic shirt, with the subtlest ease at the hip preventing the dreaded tight-striped tum. 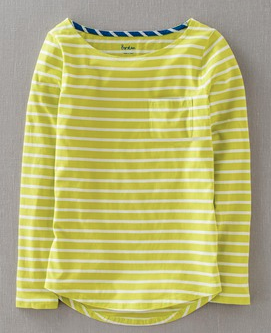 Also offered in stripes of white with coral (my pick), navy or pale yellow. I grabbed this quick shot, trying to show that stripes, unless deck-chair broad, do not make one look superwide. IRL the shirt is not as loose on me as in the photo, though I do like my marinières worn like a sailor's working garment, relaxed but not boxy. Stripes also turned up in the LE sale section, where I found an eggplant/pink striped boatneck for $10. Boatneck, shmoatneck, I'm calling it a summer-weight marinière, and a bargain. (Limited sizes and colours.) It's very well-cut. 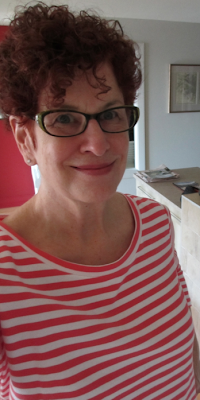 I thought about Boden's Stripy Breton top, with its curved hem, pocket detail and jaunty contrast trim at the inner neck, but several reviewers said it was thin. To me, a marinière should have just enough weight to be an almost-sweater or substantial tee. The price, roughly $47 (including shipping) wasn't bad, but adding duty and taxes would bring it to at least $60. If I absolutely had to have the colours offered, maybe. Le Duc will continue to buy St. James's Meridiens, because a) they fit him, and b) he does not consider comparison shopping fun. He just re-ups when the five or six things he habitually wears shred. Not everyone approaches value so gingerly. If the chic Christine ever gets it together to photograph a certain pair of pants, you will see a different application of the cost/value principle, called I Am Crazy About This, Who Cares What It Costs? Have you found any great lower-cost substitutes for pricier favourites? I love the color stripe you selected with your vibrant hair!! I am all about finding affordable fashion. That is my life. Great news is that there are so many different ways to dress for less. Enjoy your new ventures!! I love those coral stripes on you. You look fabulous! I ordered the same shirt but in navy/white and find it too high contrast and harsh. I prefer the lighter weight fabric for our neck of the woods, and layer over a silk or microfiber tee if I need more warmth. I think LL Bean really does do an excellent version. Thanks for the mention too! I so agree. After being retired for two years, I am beginning to feel the pinch and have stopped shopping with abandon. And that is actually a good thing. I did recently purchase Land's End ballerinas in cobalt after seeing a very similar pair in J. Crew. The J. Crew price was over $100. Land's End, $59. 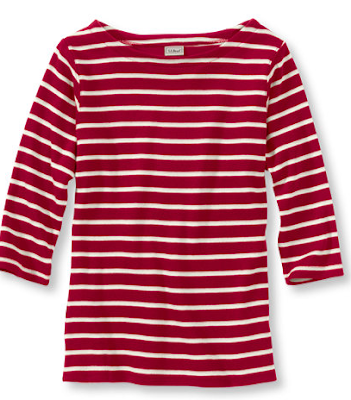 I found one with black and red stripes, and a non-regulation v-neck. Love the stripes, but the high neck doesn't suit me. Lands End and LLBean seem to be controlling their quality better these days - a while back several clients I know have sent back shoddy fabrics or badly-sewn garments. I've been looking for light summer skirts that are neither black nor pastel. It also comes in polka dots, which are cute but limit matches. Showing the petite as the regular only has the red colour left. The red and green are both pretty, but I'm afraid they might be too bright for my tastes. I'd LOVE such a thing in a darker green. How nice to meet Le Duc! I love the Saint James line and have a couple of their garments but I do find them pricey. You look great in your stripes. I have been shopping s Lands End for several years and have not been disappointed by their clothing. I do love their cashmere cardigans and hope to pick up a few when they are on sale soon. The neckline on the shirt you're wearing is just perfect -- exposes your collarbones just so. And the color is divine! You look stunning! Retirement agrees with you. I like the coral. I bought the traditional navy and white in Normandy (almost Britanny). I think that as we are retired longer, we consider price more. LeDuc looks pleased with his shirt. That photo of you is fabulous! Interesting to think about the differences I might make in my shopping patterns as I move toward retirement. So far, I've done very little online shopping, but perhaps. . .
Wow--that coral really lights you up! Great choice. And how Picasso-perfect Le Duc always looks in his marineres. I have two of these myself--neither new--a Land's End navy-on-white, and a Ralph Lauren white-on-navy (It buttons on one shoulder, a detail I like.) 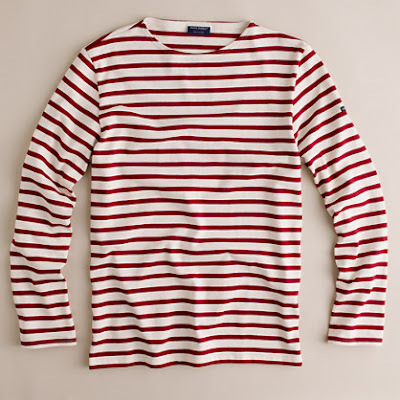 The Land's End boatneck you've shown is a great cut, and I'd be tempted to order it, but must keep in mind that, while Breton shirts are perfect here in April, by next month they will feel heavy and hot. Pam: Thanks, I still need a capsule business casual wardrobe, too. Psue: You might like the Bean one then, (at some point, they always have them) as it is navy with white, the navy ratio is higher. Kristien: It's great when the lower-cost option is just as pleasing. lagatta: Those skirts are versatile and would travel well. Dark green does not seem summery to me, but red does. I have never been one to wear dots on the bottom half but have seen some women looking perky in theirs. hostess: Like you, I buy cashmere in the summer, if there is a really good sale. I deeply miss LE's deep v-necks, they did not even offer a classic v neck last winter! Sisty: Thanks; I can wear corals and oranges and forced myself out of navy and white for a change. Jane W.: Feels great to have the stimulation of some work, but it is no longer the lion's share of my life. Madame: I think Le Duc was even more pleased with his lunch; that shot was taken in Paris! 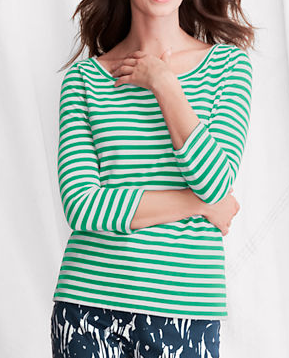 The LE coral striped top looks great on you! My husband is the same as Le Duc - he has his favourites and just buys replacements when they wear out. Cost is not a factor for him - I guess most men are like that. I have yet to try St. James marinières. I bought a Petit Bateau one about 5 years ago and it is still going strong. Duchesse, anything lighter than black is summery for me; I was laughing about a grey t-shirt I was wearing being "pastel". Pastel black, that is. Yes, I think the plain blue one would be more versatile for travel, as well as the red or the green. I do love that jade green. I can assure all the ladies that Le Duc is indeed as dashing in person as in photos, and far wittier, in French and English alike. You and your husband make a good looking couple, and I love the stripes on both of you. Stripes don't work for me though, because I need to avoid horizontal lines. Like Pam, I am all about affordable fashion. I just can't bring myself to spend tons of money on clothes, especially now my income has gone substantially down through changing jobs. It's about to go back up again, but I hope to save and spend on a new 2nd hand car, travel, dumping some into the mortgage etc instead of expensive clothes. The Great British High Street is really a thing - there are some very good cheap clothes out there if you look (also lots of tat). I always like seeing le Duc. i must get my sweetie one of those shirts! Agree with everyone, you look great in that shirt. And agree also, so fun to see Le Duc! materfamilias: Only with your comment did I realize all options were online! I appreciate the ease of ordering online and have figured out my sizing with some vendors. C. That skirts is TDF and enjoy how you have paired it with fisherman sweaters! The price of some clothing is astonishing, as I head for 65 I'm feeling sticker shock like never before. Louise: Women are talking increasingly about their "uniforms" but men have done it longer. lagatta: IMO the blue or the green would be pretty on you but you could wear your grey with the blue. Susan: I have come to see that there is a horizontal stripe for every women, it is a matter of scale, both of the stripe and cut of top. But no one "has" to wear them. Frugal: With your luck you will find one for $3 in a thrift! LPC: He has a lot of presence but his best qualities are not captured in a photo. I think you are one smashing couple...and I am certain the discussions and meals you and Le Duc share far outshine how crisp you both look in these photos. As for lower -priced options? I find the hardest part of buying plain old tees is getting the neck right. Too often, lower-priced versions have too thick a band, or they hang like a sheet. I don't wear many tees, save for under sweaters during the winter, so I simply wear the ratty ones I already own. My government salary doesn't allow me to buy the shoes I love new, but I compensate by buying my Pradas and Tods on eBay. So many people apparently have even more stuff than I do and so I score their rejects for a song! Gretchen: Thanks! Yes, the necks are often wrong and the body cut is too often just two identical halves whomped together. But what's even worse is the dye- what I call "sad" navy, or harsh reds. Great scouting for your shoes! Guess eBay finds are the result of over-spending or perhaps buying wrong size- either way, you benefit. Feels quite soft, so very comfortable to wear. Details is nice with good stitching everywhere. Choose the black leather jackets, the leather has a nice color and shining. It's a comfortable, durable, good looking jacket in www.cwmalls.com that last a long time. It runs a little big for me , but is great quality.